Those boys at PhoneDog have already given away a BIG stack of gear in their latest Facebook sweepstakes madness. It all end tonights at 3pm Pacific, 6pm Eastern via PhoneDog TV. So what can you win? How about a Samsung Galaxy Tab 10.1, Apple’s iPad 2, Asus Transformer or the HP Touchpad? Do we have your attention now? They’ve got a lot of them. You can enter at http://apps.facebook.com/pdsweepstakes for your ticket numbers. Yes, you must have a Facebook account to enter. The more friends you have on Facebook, the better, thanks to our “You Win, We Both Win!” feature. If a friend you refer wins, you win as well. You can refer as many people as you like, so this is a great opportunity for those who really want (or need) to win! The official contest post is over at PhoneDog.com. That’s where you’ll find the winning ticket numbers to compare against your own. “YOU WIN, WE BOTH WIN” is a nice new enhancement that allows you an even greater chance of winning! Think of it like this: when you refer a friend and they enter your profile ID, you’re getting access to their ticket numbers as well. If any of your referrer’s ticket numbers are drawn, you both win!? ?Let’s say you refer 10 friends. Those friends add you as the referring friend, and then they choose a prize (1 ticket), LIKE PhoneDog (1 ticket), and LIKE the seven (7) network sites (7 tickets). That’s a total of nine (9) ticket numbers for them, and nine (9) ticket numbers for you! Multiply that by 10 (number of friends you referred), and that’s 90 new ticket opportunities! If one of their ticket numbers are drawn, both you and your friend will win an Apple iPad 2, Samsung Galaxy Tab 10.1, ASUS Transformer, BlackBerry PlayBook, or HP TouchPad! 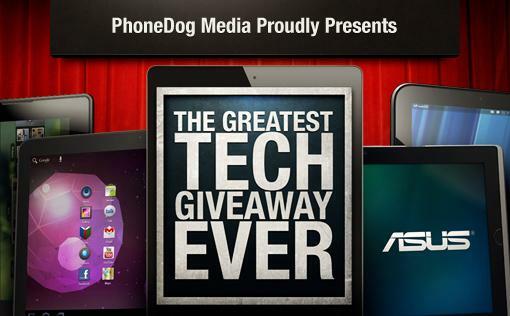 PhoneDog’s Greatest Tech Giveaway Ever runs until September 29, 2011 at 6 PM EDT/2 PM PDT. Winners will be selected starting on July 5, 2011 via a live broadcast on PhoneDog’s UStream broadcast page (http://bit.ly/PhoneDogTV) at 6 PM EDT/3 PM PDT. For more information on drawings, event times, and dates, check outhttp://on.fb.me/pdevents. Additionally, you can always view your total entries and ticket numbers by going to the “MY ENTRIES” tab within the sweepstakes application. Send an e-mail within 24 hours of the drawing for that ticket number to claimprizes@phonedog.com. We’ll need your name, mailing address, copy of legal identification, Facebook Profile ID, and your prize choice. If you’d like to change your prize selection, you’re free to do so when you e-mail the address above. Winners can expect a reply within 24 hours.